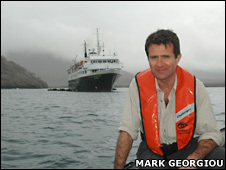 Two hundred years on from the birth of Charles Darwin, our science correspondent David Shukman travels to the Galapagos Islands where the great 19th Century figure made observations critical to his theory of evolution. Imagine how the course of history might have changed if Darwin had come equipped with cameras. Often my heart sinks while filming wildlife: if you do see an interesting creature, it usually fails to co-operate and turns to offer a view of its back end. Here, it's more a question of us co-operating with the wildlife. 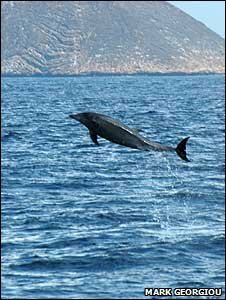 On a boat trip between islands, the rigours of a bumpy ride are instantly forgotten when a dozen bottle-nosed dolphins rise from waves and perform a series of breathtaking leaps. For an interview about giant tortoises, we sensitively position ourselves at a discreet distance from one of the animals only to find it inching nearer, as if to improve its chances of a decent close-up. 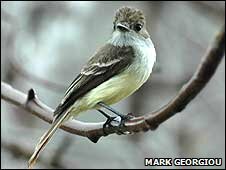 A Galapagos flycatcher, perched on a branch, remains in place as Mark's lens is just inches away. Darwin noted how the birds were so tame that people could knock them out of the trees with a stick. 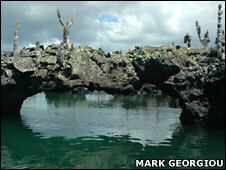 Only the marine iguanas seem a little camera-shy. Rob and I spent a hot hour stumbling over algae-strewn rocks before we found one happy to hold steady and offer wistful gazes at the sea. But sometimes we can end up a little too close. Approaching Champion Island, the sea lions race past and under our small inflatable boat like torpedoes. And crouched at the wrong end of a particularly large giant tortoise, I hear a low rumbling. I'm told it is not what I think it is, but I catch in the evening breeze a distinctive smell of farmyard. Other surreal moments? 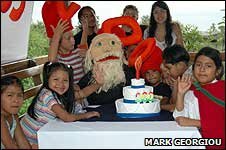 A puppet Darwin teaching local schoolchildren about evolution; in return, they sing Happy Birthday to him. Being allowed close to the last surviving member of the Pinta species of giant tortoise, Lonesome George; his ancient eyes really do look sad. And watching Darwin's war of nature unfold as fire ants swarm inside the clothes of insect specialist Henri Herrera. He is badly bitten but the rest of us suffer too. These ants had not yet invaded the Galapagos when Darwin was here. But their attack on us is a tiny sub-plot of natural selection, the inextricable combination of survival and extinction. I just wish it didn't hurt so much. Did the sand feel special, the speckled pebbles more radiant? Not really. But the beach I leap on to is where Darwin's feet once trod: Post Office Bay on Floreana Island. The man who came up with what's called the greatest idea in history picked his way up this same soft slope. His landing must have been more elegant than mine. I launch myself off the bow just as a surge carries our boat forward, and I travel far higher than expected. Into the land of the flightless cormorant arrives a flighty correspondent. Tourists love this place. It's named for the old barrel positioned just inland where seafarers left messages for passing ships heading home. I wonder how many letters actually made it. Today we have a more modern communications problem. We need to contact a small team of scientists nearby but their satellite phone isn't working. The scientists are researching the endangered Floreana mockingbird. These birds were among those collected by Darwin, and it was the differences between mockingbirds from different islands that led him to think about species adapting and evolving. Now the mockingbirds are extinct on Floreana itself. This species only survives on two tiny islets nearby. We approach one of the islets, Champion, and circle it, scanning the cliffs. There's no one to be seen. We start shouting and whistling. And waving. This is the space age and this kind of thing should be easier than in Darwin's time. He had the barrel at least. Eventually we spot the wide brim of a hat in the bushes. It's Lucas Keller, the leader of the team. The whistling and waving intensify until he sees us. We are strictly forbidden from landing on Champion because its wildlife is so vulnerable. So we inch our boat through the swell and start a shouted conversation. It's utterly surreal. As a surge brings us close, I stretch out and hand over a small video camera so Lucas can film the mockingbirds for us. Two hours later we brave the surf again to collect the camera. He has done well. 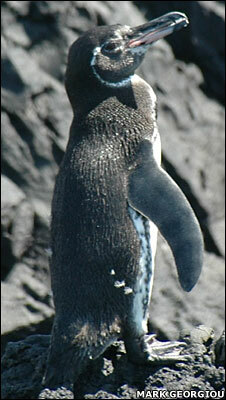 You can see his footage on our interactive Galapagos map. Maybe we have progressed beyond a barrel. I have to sing for my supper. Not exactly on the scale of Darwin - his duties included providing his captain with intellectual company on their half-decade together at sea. But while the Beagle could venture wherever Robert Fitzroy wanted to take his ship, we have to contend with storm-force bureaucracy regulating which boats can go where. The rules are totally justified to prevent the place being overrun. 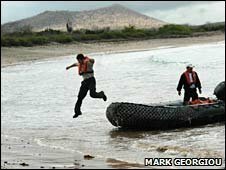 But, when the boat we hire - with the correct papers - suffers the 21st-Century equivalent of entering the windless doldrums, we are left stranded. Luckily our guide and translator Emma Ridley persuades a tourist ship to loan us a launch, equipped not only with a working engine but also the right licence. But there is a price: I have to give a talk about our assignment. So along with producer Mark Georgiou, cameraman Rob Magee and radio producer Peter Emmerson, I board the Polaris and address a lounge full of eager, questioning Americans. What angle are you looking at? Well, these islands are at a crossroads of choices about their future. How are the cameras coping with the heat and humidity? Not very well; today it hardly ever stops raining. The experience unexpectedly brings back memories of far chillier circumstances: three of us had travelled aboard a strikingly similar vessel in the Arctic, sailing through the North West Passage. There's a trigger for another polar memory, too. Flapping cutely on a rock are two birds better suited to Antarctica: penguins, the Galapagos variety, clinging on in the Tropics, increasingly endangered as the waters get warmer. A giant frigate bird circles in the dusk sky. A lurid depiction of Charles Darwin adorns an arch outside our hotel. Once again, there's a sea lion snoozing beside our table. It's no longer a surprise. I must be evolving too. My luggage is heavy: like many visitors clambering off the plane, I've brought a small Darwin library including The Voyage of the Beagle and On the Origin of Species. One risk, just below the equator, is sunburn. Another is pretentiousness: I can't be the first to feel the constant temptation to compare the great man's observations with mine. At first, everything is disappointingly normal: a small airport on flat scrubby land, not a creature to be seen, and the massed beeping of mobile phones successfully finding a signal. Darwin was disappointed for rather different reasons - "nothing could be less inviting", he wrote about his first sight of "stunted, sunburnt brushwood". It's the hot season, which means it's probably wise to avoid the hottest terrain, the black wastelands of the lava fields. I somehow find myself in amongst them at noon. The sun scorches from above and the dark rocks blast heat from below. The word "sauna" leaps into my overheated mind. Darwin's thermometer could record up to 137F (58C) but he was convinced the temperature was higher. Even in thick boots, he found the black sand was "disagreeable to walk over". I cool down with an iced drink. 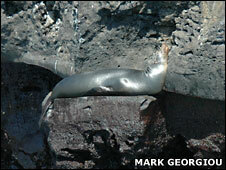 I hear snoring from a wooden bench nearby: a sea lion is sprawled on it, twitching in its sleep, unfazed. 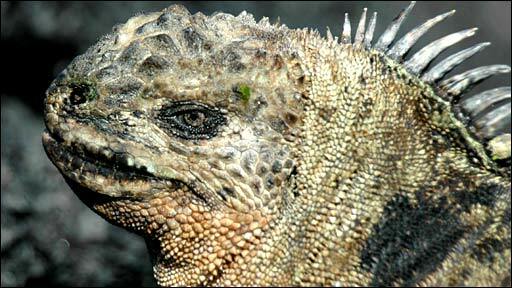 A marine iguana casts a glance at me but does not leave. You don't view wildlife here, you mingle with it. And this has not changed since Darwin's time. He noted the "extreme tameness" of the birds, not yet "adapted to the stranger's craft or power". As I put Origin of Species on my bedside table, I push aside the remote control for the air conditioning. I could never endure five years on a tiny sailing ship, but surely, in a brave spirit of solidarity, I can choose to sleep without chilled air? Not for long. I wake up baking, reach for that remote and read how "endless forms most beautiful and most wonderful have been, and are being, evolved". Until the room cools down.